A University of Miami (UM) Rosenstiel School of Marine and Atmospheric Science-led research team analyzed polycyclic aromatic hydrocarbons (PAHs), the most toxic components of petroleum, based on the BP Gulf Science Data's extensive water chemistry samples taken within a 10-kilometer (6-mile) radius of the blowout site. 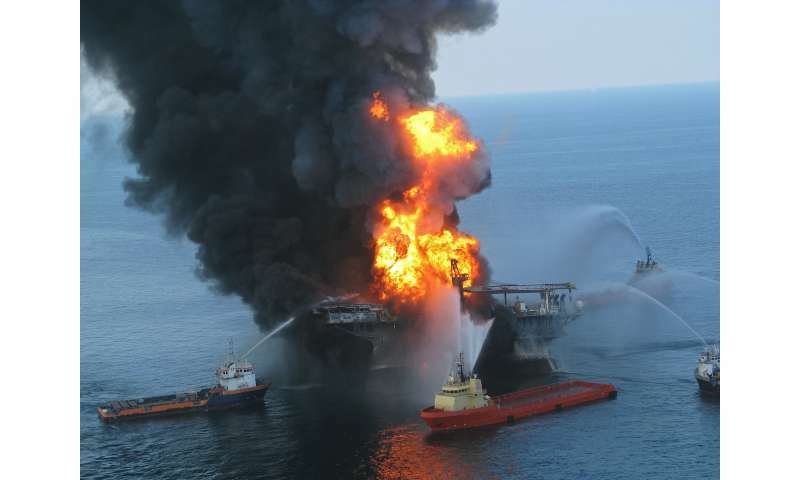 The results of this analysis demonstrated that substantial amounts of oil continued to surface near the response site, despite 3,000 tons of subsea dispersants injection (or SSDI)—a new spill response strategy meant to curb the spread of oil and facilitate its degradation. "The results of this study are critically important," said the study's coauthor Samantha Joye from the University of Georgia. "This work shows clearly that the eruptive nature of the Macondo discharge was more than sufficient to generate the deepwater oil plume. Further, application of dispersant did not increase the amount of oil in the aqueous phase or change the distribution of oil over depth. These findings should change the way we think about spill response and calls for a reconsideration and reprioritization of response measures." The team's research, led by Claire Paris, professor of ocean sciences at UM, founded on an unprecedented volume of data publicly available through the Gulf of Mexico Research Initiative Information and Data Cooperative (GRIIDC), demonstrated that the formation of the massive deepwater oil plumes was unrelated to the new response. They further show, in agreement with previous studies, that plumes of oil persisted in the Gulf months after the spewing wellhead was capped 87 days later. The powerful chemical dispersant, called Corexit, may have added to the ecological damage by suppressing the growth of natural oil-degrading bacteria and by increasing the toxicity of the oil itself. (A) Stations located within 100 km (magenta stations, n = 7,741) and 10 km (yellow stations, n = 3,464) perimeters from Macondo (red +) are used to analyze the monthly distribution of low (C5- C12) and high (C13+) molecular weight petroleum hydrocarbons, and to evaluate sub-sea dispersant injection (SSDI) volumes on the vertical distribution of total petroleum hydro- carbons around the response area, respectively. Green dots are GSD stations outside the study area (n = 5,477). The gray lines are at the 1,000 m and 2,000 m isobaths. (B) Three- dimensional view of the selected stations relative to Macondo wellhead's depth (red circle, not to scale). Credit: Claire Paris). BP Gulf Science Data (GSD) Water Chemistry Data stations collected during the Deepwater Horizon (DWH) blowout from May to December 2010. "Our earlier work using computer modeling and high-pressure experimental approaches suggested that pumping chemical dispersants at the spewing wellhead may have had little effect on the amount of oil that ultimately surfaced. But empirical evidence was lacking until the release of the BP Gulf Science Data. When completely different approaches converge to the same conclusion, it is time to listen," said Paris. "There is no real trade-off because there is no upside in using ineffective measures that can worsen environmental disasters." As the oil industry drills in deeper and deeper water, it must find alternative strategies to manage blowouts, says the study's authors. The "capping stack" method in which BP used to stop the wellhead outflow may be a more effective first response strategy. Bio-surfactants, which are less toxic and more efficacious to biodegeneration, may offer a viable alternative for oil spills in shallow waters, according to the researchers. 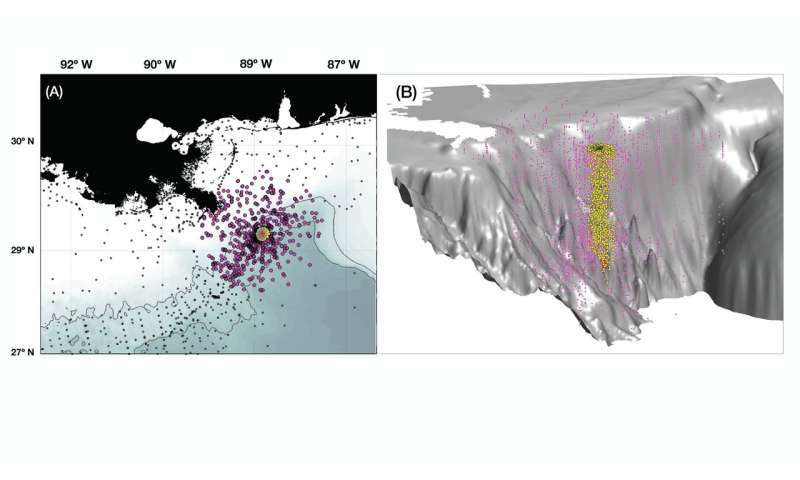 "This type of data management is a strategic asset enhancing both science and management as it allows scientists to use data-driven approaches and test important hypotheses for better understanding and managing future oil spills," said Igal Berenshtein, a coauthor of the study and postdoctoral researcher at the UM Rosenstiel School.